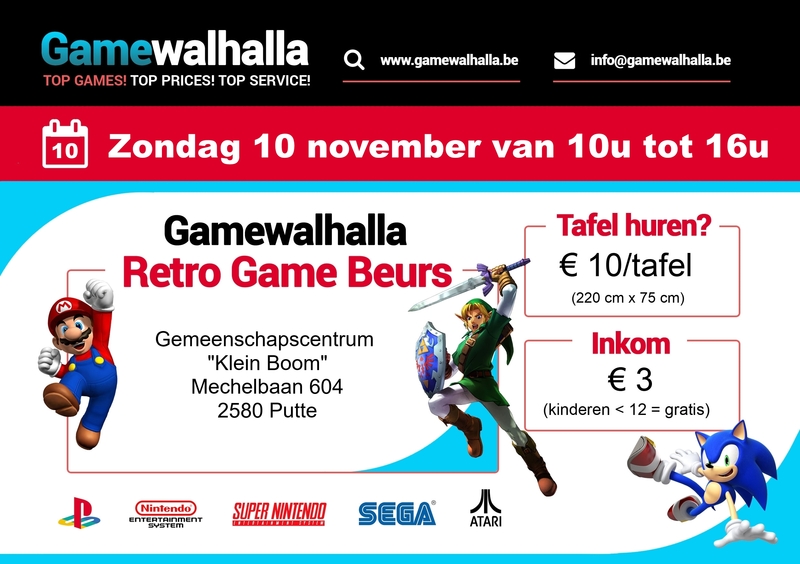 With almost 1000 visitors the Gamewahalla retro gaming convention has become one of the biggest conventions of Flanders as well in number of visitors as in number of exhibitors. For the 7th edition of our convention we return to Putte. A cosy 800 m2 sport hall completely filled with 300 m of tables filled with retro games, consoles, merchandising, toys and a lot more. As always we make sure to have a nice mix between (online) shops and collectors from Belgium and Holland. You're a retailer? A collector? Webshop. Then rent 1 of more tables. You would like to register? Then download our registration form (in Dutch), fill it out electronically and send it back to us by email. In a short time our retro gaming convention has become one of the biggest in Flanders with almost 1000 visitors. So perfect to sell your items, to meet your customers in real life or to increase your brand awareness. As a collector its ideal to sell or exchange your duplicates or to get in contact with other collectors. You would like to sell something else then retro games? Statues, marchandising, vintage toys,... Just name it. As long as it fits in the (retro) gaming/geek culture you're more than welcome. The interest of our visitors isn't just limited to retro games. ATTENTION: we have a lot more demand to hire some tables than we've got space to put them. So to give as much exhibitors as possible a chance to hire some tables the max. number of tables you can hire is limited. You find more info about the max. number of tables you can rent in our registration form. Come to visit the largest retro gaming convention of Flemish Brabant and surroundings with almost 1000 visitors and 300 meters of tables filled with retro games, consoles, accessories, merchandising,... The emphasis is obviously on the games from the good old days, but you'll also find more recent games, merchandising, toys,... A bit of everything that fits in the geek/(retro) gaming culture. Gemeenschapscentrum Klein Boom is easily accessible by car with a large, free parking next to the hall. Make sure to have cash money. There are no ATM's in the neighbourhood. You can also buy something small to eat and drink.